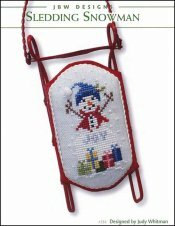 Sledding Snowman [W5045] - $8.00 : Yarn Tree, Your wholesale source for cross stitch supplies. Cross stitch pattern by JBW Designs. Want to build a snowman?!?! With a red scarf around his neck & a blue stocking cap on his head....this snowman is all bundled up for winter. Snowflakes are decorating the crisp winter sky. Stitch count 24W x 50H. Stitched on #2561 Zweigart Belfast Linen 32ct. Vintage Blue Whisper (over two) or #2570 Zweigart Cashel Linen 28ct. Blue Whisper (over one).